MUMBAI: Yeh Hai Mohabbatein actress Divyanka Tripathi is a total enchantress. Her undying love for ethnic wear and the way she carries herself in sarees is captivating, and she never fails to wow us with impeccable fashion sense! The actress, who enjoys a huge fan following, is quite active on social media and keeps treating fans with her wonderful pictures. 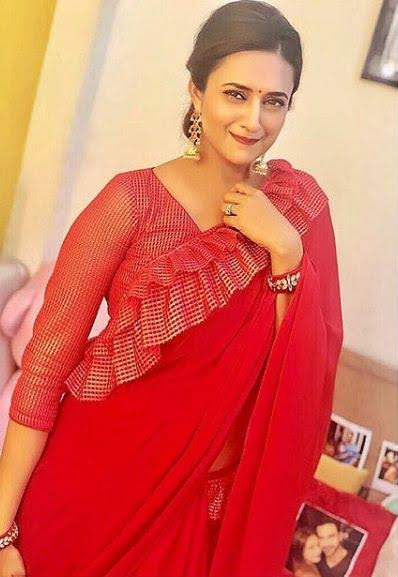 She looks gorgeous in her latest Dussehra photo where she poses in a red saree. We love how she blends the Western into the ethnic to make a unique fashion statement. Her red blouse is checkered with gold, and to coordinate that with her saree, she has a layer of checkered ruffle work that enhances her overall unique look. A bun, red pop on her lips, golden jhumkas, and a pair of red kadas with stone embellishments complete the outfit, and she sends out a warm and festive vibe. Check out her picture below! Are you inspired to get a similar look this Diwali?